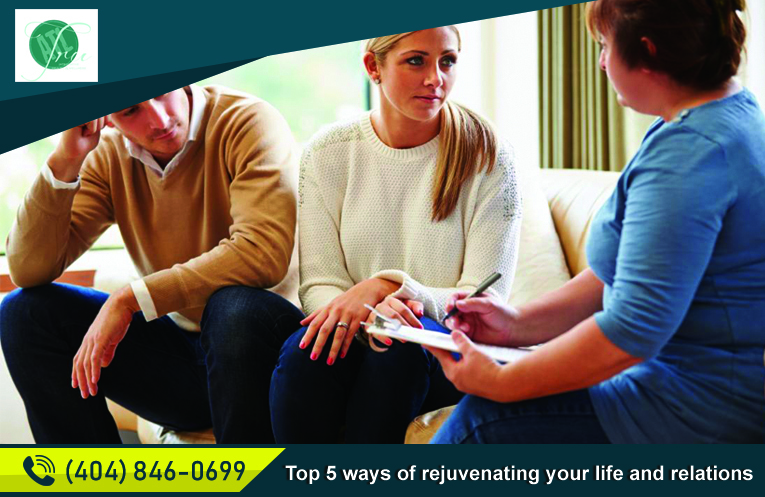 How Marriage or Couple Counseling can Reinvent Your Life? Introduction – In the present social structure, marriage is considered to be the happy conclusion of a relationship between two people in love. Marriage brings a new lease of life to people and their romance, but unlike every fairytale, not every marriage remains blissfully happy forever. People evolve in their relationships and sometimes they lose their way. As a result, marriages get strained. Sometimes, the stress of work and fast life tends to break a lot of marriages. If you are experiencing problems in your marriage, it is time to seek professional help and Couples counseling in Atlanta will provide exactly that. Marriage Counseling as a Process – Counseling is a process where you get to share your thoughts, beliefs, desires, pains, happiness and every other feeling with a trained professional who is capable of understanding the problems and find the perfect solutions. Couples counseling is the method where you will be talking with a trained counselor and your significant other. One of the biggest reasons behind failed marriages is communication gap, misunderstanding and sometimes absence of communication altogether. The confidential and safe environment counseling provides helps people realize their mistakes, the goodness in others and helps them speak their minds which most of the times ends the misunderstanding and communication gap. Counseling also reinvents a relationship by bringing back love into the fold. The Insights in Your Marriage – A well-trained and competent couple counselor will help you to understand the following points which in turn will help to understand the relationship better. One needs to be realistic about marriage, because just like fairytale lover stories, fairytale marriages also don’t exist. Marriage is not a spur of the moment decision. It requires involvement, love, commitment and the desire to be with someone for a long time. It is not just a fad or an achievement to showcase to other people. Like any other area of life, marriage also requires hard work, patience and understanding. Defining your problems will help salvaging the situation just like any other area. Nurturing and taking care of yourself also means taking care of the relationship. So, investing in your well-being ultimately helps both the partners. Giving-up your grudges, adapting a logical outlook and willing to admit your mistakes will help too. By visiting a couple counselor, you will be able to identify the problem which will prove to be a crucial step in saving the marriage. So, by choosing Couples counseling in Atlanta you will ensure that your marriage gets reinvented and becomes stronger than ever.